Life after LeBron James wasn’t easy on the Cleveland Cavaliers in 2010, and the same could be said for the 2018-19 season. According to Jason Lloyd of The Athletic, the Cavs suffered through similar struggles this season. When I picked up a brief road trip to Boston in January, I was astonished at how low the morale was,” wrote Lloyd. “This is when everyone was injured and the losses were mounting. I almost wrote everything I learned during those few days, but I wanted to give it time to see whether things would improve. Teammates were verbally stabbing each other. There seemed to be little trust throughout the organization. But after setting the barn on fire with the J.R. Smith story in November and then the Larry Drew piece on that same Boston trip, I didn’t want to keep piling on. I wanted to give the franchise time to get healthy and recover. Injuries, a coaching change, and a string of bad losses clearly took a mental toll on the Cavs this year. Both seasons immediately after James’ departure ended with a 19-63 record. Despite the poor win-loss total, there is some optimism in Cleveland. 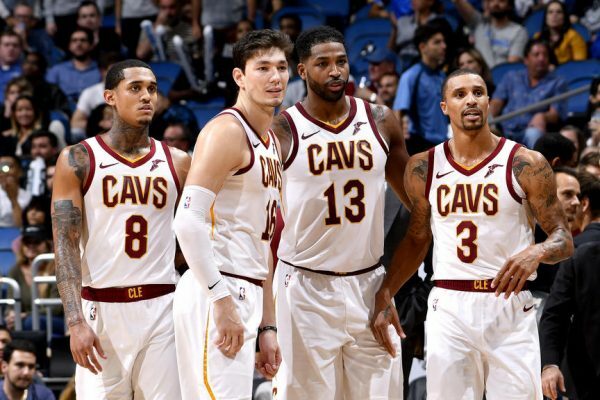 The team has a solid mix of young talent like Collin Sexton and Cedi Osman mixed in with veteran leaders like Kevin Love and Tristan Thompson. Of course, there is still much work to be done before the Cavs are considered contenders in the Eastern Conference again. First, Cleveland needs to hire a coach who can provide steady leadership. Moreover, the Cavaliers might be in position to land a franchise-changing talent like Zion Williamson in the 2019 NBA Draft. It all depends on the lottery, but the Cavs will have a 14 percent chance to land the first overall pick. Obviously, the 2018-19 season was a difficult year for the organization, but there is still optimism in the air in Cleveland.